Upon recounting our tale of woe at check in, they immediately upgraded us to a deluxe room, in a location that was fairly secluded so we didn’t have to worry about noisy neighbors. We wound up with a corner room facing on one side the Marriott, and the other the Calgary Tower. The room itself was incredibly spacious with a large bed, sofa, walk in closet and beautiful bathroom. The hallways were eerily quiet in the late afternoon and at night, with music playing softly only during the day. The room was also extremely quiet once inside, no noise could be heard from the hallway or adjoining rooms once inside. 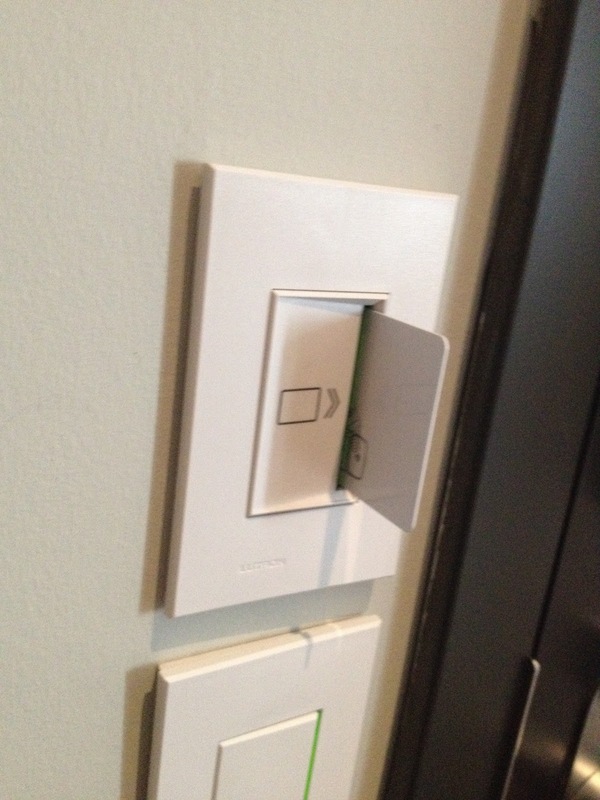 Once inside, your prox card is inserted into a slot on the wall in order to activate the lights and electronics in the room. 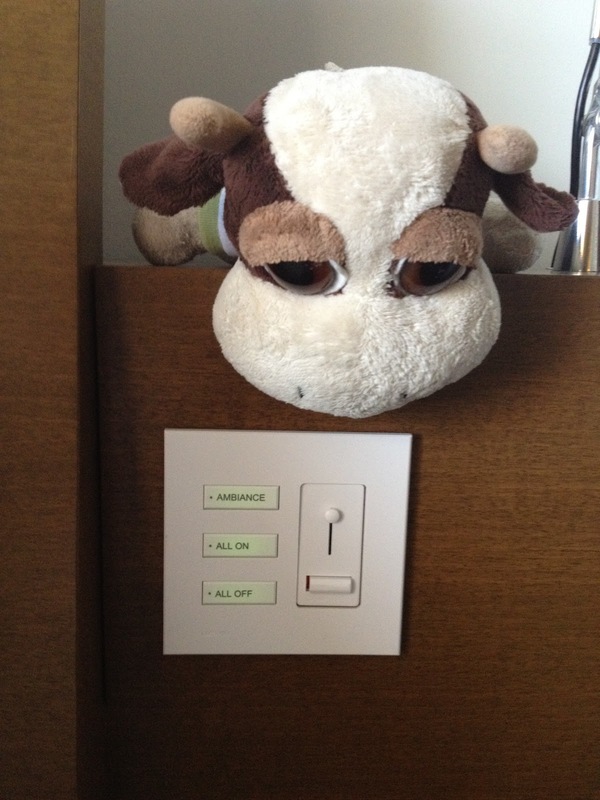 If removed, the lights turn off automatically after a few minutes in order to conserve energy. 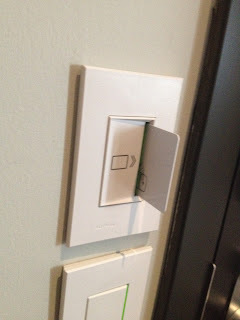 Instead of utilizing cardboard placards hung off the door to indicate one would like privacy or their room cleaned immediately, there was a switch inside the room where one could flip one direction for “Do Not Disturb” or the other for “Please Clean”. Underneath the lit room number in the hallway was a small light that was either red or green, depending on what you picked, or not lit up at all if the switch was in the neutral position. The room itself was well designed, with light switches right beside both sides of the bed so you could control all of the room lights from the bed without having to get up. For plugging in your electronics, there was a panel built into the desk and hidden. It consisted not only of electrical outlets, but also USB, HDMI, and an audio plug. The storage itself is unobtrusive, with shelves built into the wood paneled walls to store the iron and ironing board. The walk in closet contained ample closet space to hang items up, put clothing into drawers, an area to sit to put your shoes on, as well as an in room safe large enough to accommodate 2 laptops. The washroom had a European style toilet that had a separate area and door. The shower had a hilariously large rain showerhead as well as a hand held shower wand. Unlike other hotels that utilize small bottles of shampoo, conditioner, and shower gel, Hotel Le Germain opted to have large bottles of Moulton Brown products mounted inside the shower so that guests could use as little or as much as they wanted. The bed itself was exceptionally comfortable, along with fluffy sheets, comforter and a mountain of pillows. The only disappointment was that there was no coffee machine in the room other than a Nespresso machine, and the pods were $2.50 per piece. Which meat that the only way to make hot water for tea was to run water through the Nespresso machine without a pod, which really only resulted in luke warm water and the tea, we had to provide ourselves. The continental breakfast that was included was actually quite good, with a large variety of items to choose from both hot and cold, including pastries, porridge, yogurt, granola, chacuterie, cheese, etc. The staff were very accommodating, as when we checked in, they had been unable to find the booking we’d made online the night previous, but quickly checked us in regardless so that we could settle in ASAP instead of standing at the front desk waiting for them to find the booking. The next morning when we checked out, they even followed up with us to make sure that we managed to finally get a night’s rest since they remembered what we had told them during check in about our previous nights at Hotel Arts. Overall I would recommend Hotel Le Germain for anyone looking for a central location to stay in Calgary. Granted their prices are higher than many, we managed to get a good deal at the last minute on Booking.com. Besides the fact that we’d learned that you do actually get what you pay for. If you need a place to stay that’s comfortable, quiet and accommodating, Hotel Le Germain fits the bill.